There are some really great couples only all inclusive resorts. On this page you will find links to reviews of not only the outstanding Couples and Sandals resort chains which offer outstanding Caribbean all inclusive couples resorts, but also to other properties and locations around the globe. We will also link to pages which review the best couples and adults only all inclusive resorts around the world. Sun Palace is a dedicated Couples Only all inclusive resort where you will not find any kids in any form. This resort made the TA list of the most romantic resorts worldwide recently and has powered on generating great reviews from it's guests ever since. 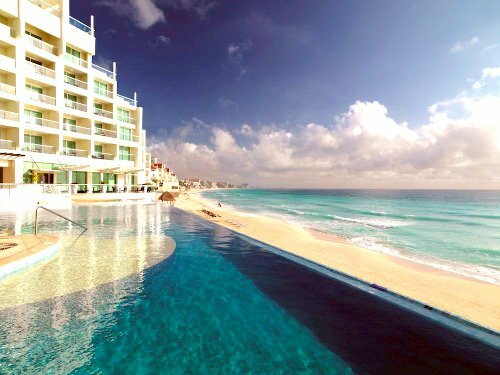 You will find it on the quiet southern end of Cancun with good access to the white sand, clear water beach. Enjoy a swim with the dolphins and a good variety of romantic bars and five top restaurants. More information, special offers and reviews for Sun Palace Couples Only All Inclusive Resort. 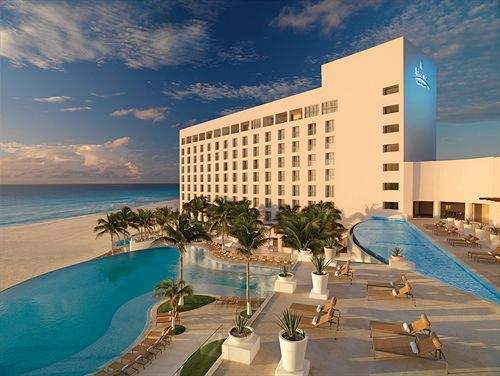 See the 15 Top Cancun Adult All Inclusive Resorts. 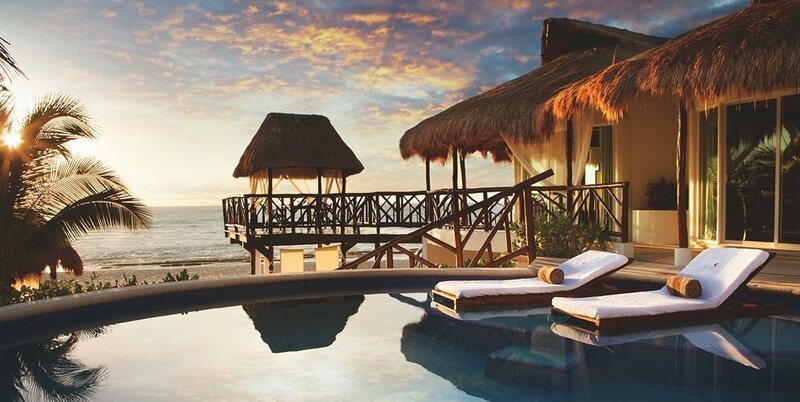 Many of the best couples all inclusive resorts are located in Mexico's Riviera Maya. This one is not any exception and is located on the very romantic sounding clear waters of Playa Del Secreto or Secret Beach. Couples Swept Away All Inclusive is a great option and one of the best Couples Resorts in Jamaica. An all-inclusive beachfront resort in Negril, Jamaica. Included are most meals, drink and water sports. Nightlife and shuttle services are also complimentary. This resort gets really excellent reviews from past guests - many of whom return often. Transform your Jamaica vacation into a romantic escape at one of the four ALL-INCLUSIVE adults-only Couples Resorts. 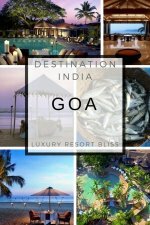 A couples-only resort which has won awards for the worlds best honeymoon location (on the beach). 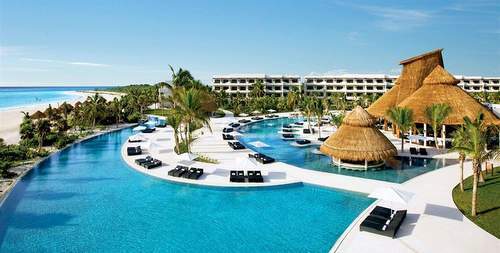 There are five freshwater pools, swim-up pool bar, five soothing whirlpools, six other bars, and four restaurants. There are a wide variety of activities included in the nightly rate. 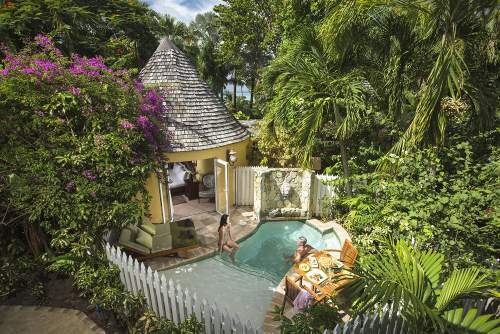 Save up to 60% off and 1 Night free plus a $100 Red Lane Spa Credit at Sandals Grande Antigua Resort & Spa. The Dominican Republic, after Jamaica and Mexico, is the prime location for couples and adult only all inclusive resorts. See all the Dominican Republic Couples All Inclusive resorts here. On a 2.5 kilometer stretch of powder white beach, this resort is in the Dominican Republic. 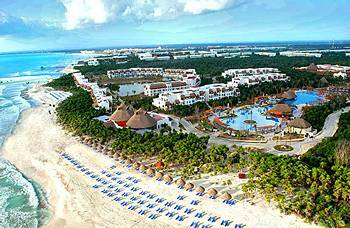 See reviews and special offers for Excellence Punta Cana Couples Only All Inclusive Resort. Framed by mountain views and edged by the Caribbean Sea on Gros Islet, St. Lucia. Pigeon Island National Historic Park is positioned 1km from the resort. This property partners with two other Sandals resorts located nearby. Complimentary shuttles transport guests between the properties. Guests have full access to all three resorts facilities. Located on Malabar Beach, this 3 star resort is set in a tropical garden. 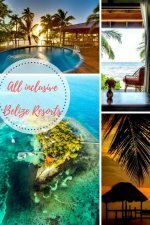 An all inclusive stay here includes: accommodations, all meals and snacks, unlimited alcoholic and non-alcoholic beverages, all land sports (like tennis and golf), all water sports (like scuba diving and water-skiing). A past guest has said: "An Adults all inclusive stay without any over-enthusiastic activities co-ordinators". Sound like what you're looking for? Located less than 4 kms from the capital city of Castries on the island of St. Lucia. The resort stands amid 210 acres of green hills on a coral bluff that juts over a long crescent-shaped beach. There are a total of 16 on-site restaurants and bars as well as access to the facilities and amenities of two other Sandals resorts. Champagne welcomes you upon arrival. More on the Sandals Regency in St Lucia. This top couples all inclusive resort stands along a 300-meter stretch of thatch-shaded Caribbean beach in Castries, the capital city of St. Lucia. Tourist destinations include the Rodney Bay shops located 10 kms from the resort. Guests are entitled to dine and use the facilities at Sandals' other 2 resorts. Watercraft and snorkeling gear are complimentary. A 9-hole golf course located nearby for guests. Quietly nestled on Nassau's famed Cable Beach in the Bahamas. Guests can enjoy the colonnaded pool and dine at their choice of eight gourmet restaurants. Lots of great water and land activities included in the package. Save up to 65% plus 1 Night Free and a $100 Red Lane Spa credit at Sandals Royal Bahamian Spa Resort & Offshore Island. 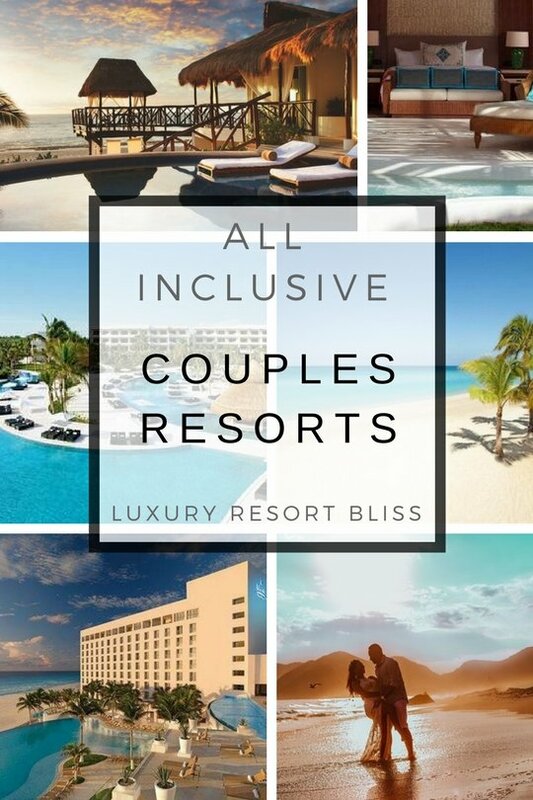 Would you like to see more than these couples only all inclusive resorts? You might want to talk a look at: Couples Resorts, Couples Resorts in Jamaica, or All Inclusive Honeymoon Resorts.